The most frequent cause of enlarged thyroid is iodine deficiency. The thyroid gland needs iodine to synthesize thyroid hormones. 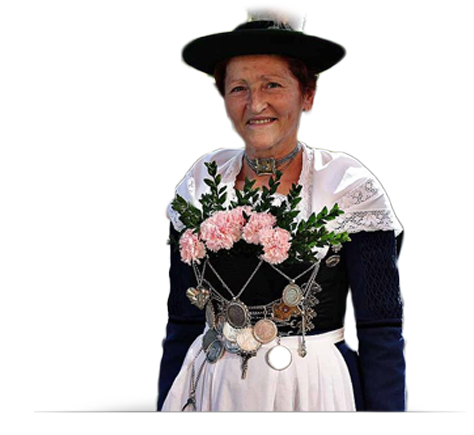 Germany is an iodine deficient country, enlargement of the thyroid, or goiter, can be considered to be endemic here. Iodized salt is used to counter the iodine deficiency. Iodine need varies among individuals, gender-specific and genetic differences as well as dietary factors can hinder the uptake of iodine. This helps to explain why an iodine deficiency in a given population does not result in a universal incidence of goiter. As Grade 0 goiter could be designated a not yet visibly enlarged or palpable thyroid gland, Grade IV (not official existing though) would be a goiter visible from behind. The thyroid gland originates in the pharyngeal pouch, which arise from the floor of the foregut near the pharyngeal arches. During embryonal development they descend toward the trachea. This explains why residual thyroid is found at the base of the tongue and thyroid duct remnants cranial to the thyroglossal duct or pyramidal lobe. The thyroid is supplied by the superior thyroid artery, the first branch of the external carotid artery. This cranial blood supply is also a embryological relic. The second part of the arterial blood supply is provided by the thyrocervical trunk, which arises out of the subclavian arteries. An anatomical variant of this is an unpaired thyroidea ima artery which arises directly from the aortic arch and supplies the caudal pole of the thyroid. The venous supply is more irregular, generally involving the superior, middle, and inferior thyroid veins. There are also numerous lateral thyroid veins, known surgically as Kocher’s veins, which can be very well developed to varicose depending on the illness. Of great important in thyroid surgery is the recurrent laryngeal nerve. This branch of the vagus nerve loops on the left side under the aortic arch, on the right around the brachiocephalic artery and travels along the posterior aspect of the thyroid gland in close proximity to its capsule. It enters the larynx and innervates the vocalis muscle. Recurrent laryngeal nerve paralysis is a feared complication of thyroid surgery that can cause hoarseness or – in bilateral lesions – respiratory paralysis due to vocal cord collapse. The rate of postoperative recurrent laryngeal nerve paralysis can be lowered to <1% by careful dissection using magnifying glasses with intraoperative neuromonitoring. The parathyroid glands are located bilaterally on the posterior side of the thyroid gland. They synthesize parathormone, which regulates serum calcium concentrations in the body. The parathyroid glands must be preserved in thyroid surgery. Surgery for malignant thyroid tumors always includes resection of the draining lymph nodes. A distinction is made between a cervical central compartment extending to the carotid artery and jugular vein, from which lymph nodes are routinely removed, and a lateral compartment from which they usually are not. Another compartment is the mediastinum. A change in the hormone metabolism status can be associated with subtle to conspicuous symptoms, which are not always specific and can present challenge to the treating physician. An elevation of thyroid hormone levels, a hyperthyreosis, can be accompanied by anxiety, flushing, heat intolerance, tachycardia, cardiac arrhythmia, weight gain, gastrointestinal symptoms such as diarrhea, and psychomotor overexcitability. The non-specificity of the symptoms can be so great that diagnosis of hyperthyreosis can only be made by a psychiatrist. Hypothyroidism is accompanied by weight gain, fatigue and lethargy, depression, and sensation of cold. Together with the patient’s medical history, clinical examination can provide valuable diagnostic clues. In the latter, the sitting patient is examined by palpating the thyroid from behind. Thyroid nodules may be detected during the exam, their size and consistency should be estimated and whether they makes it difficult to swallow or breathe. If the thyroid does not move when the patient swallows, this suggests an infiltrating process. Occasionally a thyroid bruit can be palpated. This finding is typical of Basedow’s disease (Grave’s disease) with pronounced hyperthyreosis and feels like a wasp’s nest is located beneath the skin. It is caused by arteriovenous shunts, which can occur when the flow of blood to the thyroid is markedly increased. A similar tactile finding can be made on dialysis shunts. Further signs of Basedow’s disease can be found by visual diagnosis and are discussed in the relevant chapter/section. Routine laboratory diagnostics of the thyroid gland include fT3 and fT4, the free forms of the otherwise protein-bound thyroid hormone. The thyroid-stimulating hormone (TSH) is also determined for assessment of the pituitary gland regulatory circuits. Expanded lab diagnostics include antibodies and tumor markers, which will be discussed in the respective chapters. 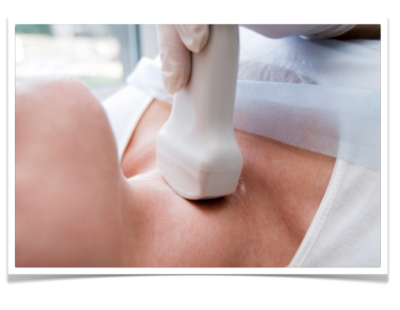 Thyroid gland sonography is quick and almost universally available. An experienced examiner can accurately judge the size of the thyroid gland and detect nodules. Depending on the internal echo pattern, the nodules can be designated as echo poor, echo rich, or as having an inhomogeneous echo. Often the pituitary glands can only be distinguished when they are enlarged. In addition to morphological evaluation by sonography, the metabolic activity of the nodules should be assessed by thyroid gland scintigraphy. Briefly, radioactive iodine is applied and the function of the thyroid visually displayed with a special camera. Zones with elevated metabolic activity are termed hot nodules, diminished uptake of radioactive iodine characterizes cold nodules. A hot nodule indicates an autonomous zone, where the thyrocytes elude the normal control loop and the influence of the pituitary. A cold nodule with diminished metabolic activity is always suspicious for, though not proof of, malignancy. 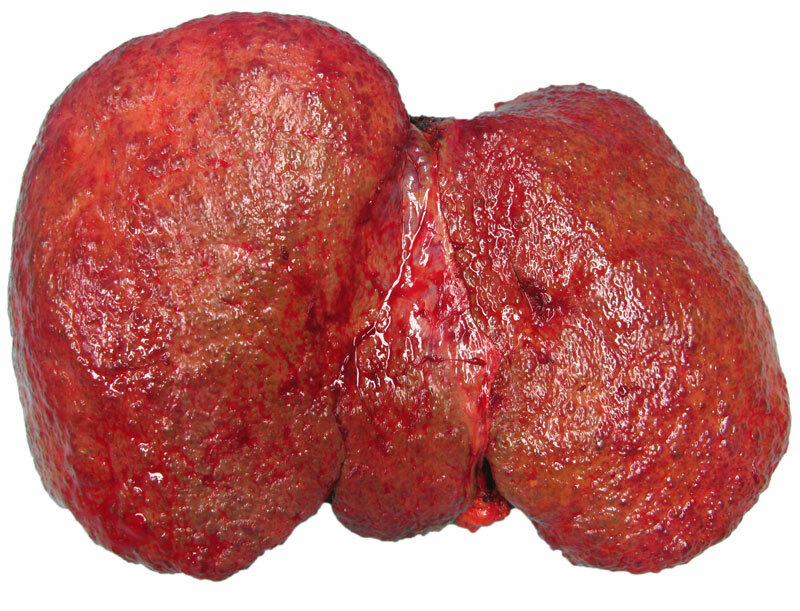 A cold nodule is therefore not an indication for surgery or proof of carcinoma. A finding suspicious for malignancy can be further clarified by fine needle aspiration cytology. Done with a very fine needle, this type of biopsy has the inherent limitation that the few cell layers of the nodule obtained with the thin hollow needle (23-25 gauge) cannot be representative of the whole nodule. A negative biopsy cytology never excludes a carcinoma. Due to the inhomogeneous architecture of the nodule, false negative findings are not at all rare. A positive histology must in any case be confirmed by surgery and a definitive histology. The diagnostic validity of fine needle aspiration cytology is therefore controversial, also because needle biopsies always cause thyroid adhesions, which complicate layer-specific dissection in subsequent surgery. Whether a patient should be biopsied using this method depends on various sonographic criteria of malignancy including an altered internal echo pattern or arteriovenous shunt phenomena within a suspicious nodule. Every goiter that causes mechanical complications should be operated. Suspicion of malignancy or presence of a positive cytology are also indications for surgery. Not every cold nodule requires surgery. If during course, however, continued growth is observed or if the patient’s or his or her family’s history exhibit further risk factors, an operation is advised. A hyperthyreosis can also be a indication for surgery. Drug therapy is less effective in treating hyperthyreosis than hypothyroidism. For Basedow’s disease (Grave’s disease) thyreostatics such as Thiamazole are usually used. If a trial stop of drug administration is followed by recurrence, surgery is indicated. External iatrogenic iodine can also give rise to a life-threatening hyperthyreosis, which in some cases can only be treated by surgery. This so-called thyroid storm can be caused by iodinated contrast media or medications such as antiarrhythmic drugs. The clinical picture includes cardiac symptoms like tachycardia, arrhythmia, somnolence, and markedly elevated body temperature. Patients experiencing a thyroid storm should be placed in an intensive care unit where they can be treated with beta blockers and antithyroid agents. In individual cases an emergency thyroidectomy may be indicated. The goal of every operation on a thyroid with nodular changes is to reliably remove all suspicious Knotenbefunde. The risk of a subsequent hypothyroidism is acceptable, it can be easily treated with drugs. Hypothyroidism it is also much less serious than an overlooked Knotenbefunde, which cannot be clarified histologically and could make necessary later surgery with an attendant much greater risk of recurrent laryngeal nerve paralysis. The operation begins on the side with the main suspected Knotenbefund. A so-called Kocher transverse collar incision is made about 2 finger breadths above the jugulum in the reclining patient and the platysma, a broad sheet of superficial muscle innervated by the facial nerve, is severed. Underneath lie the superficial cervical fascia, which is severed longitudinally. The underlying straight neck muscles from the tongue bone to the sternum and from the thyroid cartilage to the sternum are bluntly pushed aside. Next the thyroid gland is exposed, taking care not injure the thyroid capsule, which could lead to nasty bleeding bleeding. Depending on the site, first the lower or superior pole of the thyroid is mobilized and dissected between clamps. On the upper pole, the superior thyroid artery is dissected. Particular attention should be paid in this step to the parathyroid glands, of which there are normally four located dorsal of the thyroid. If they are not enlarged, they can usually be recognized only against the somewhat darker fat tissue. The goal should be to leave the parathyroid glands together with their vascularization in situ so as to prevent subsequent hypothyroidism and hypoparathyroidism. If the thyroid is greatly enlarged or malignantly changed, its capsule may “swallow up” the parathyroid glands, so that only after the thyroid has been removed does it become evident that a parathyroid gland was also resected. If this happens, the parathyroid glands can be autotransplanted into a muscle, e.g. the sternocleidomastoid muscle, which has already been exposed in the OP. Because microsurgical anastomosis of the parathyroid vessels is not possible, the tissue at the implantation site in the muscle is supplied with oxygen by diffusion. To make this easier, the parathyroid gland surface area is greatly increased by cutting it into small 2-3 mm pieces. As a rule, an autotransplanted parathyroid resumes normal function after a few days. To ensure that no parathyroid glands were injured or removed, thyroid surgery should always include visualization of the parathyroid glands on the affected side. A further key point of thyroid surgery is the visualization and preservation of the recurrent laryngeal nerve. 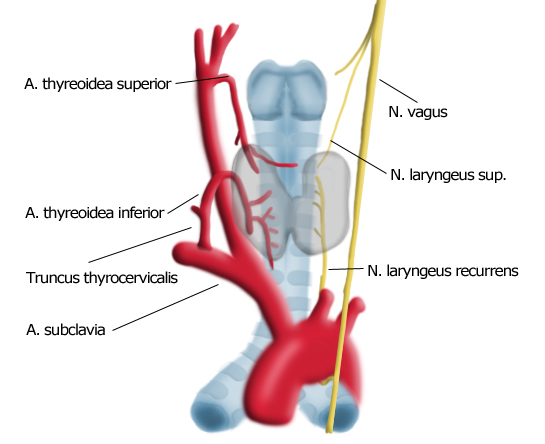 This branch of the vagus nerve travels along the posterior margin of the thyroid in very close proximity to its capsule in the larynx where it innervates the vocalis muscle. Unilateral injury to the vagus nerve leads to unilateral vocal cord paralysis, which can cause hoarseness. If the recurrent laryngeal nerve is severed, the vocal cords collapse leaving a small residual opening and hindering normal breathing. This may require a permanent tracheostomy. Subtle preservation of the nerves is therefore of vital importance for patients. In most cases, unequivocal macroscopic visualization is enough, especially if done with microscopic glasses. Neuromonitoring can also be used to show the nerve’s course and test its function intraoperatively. 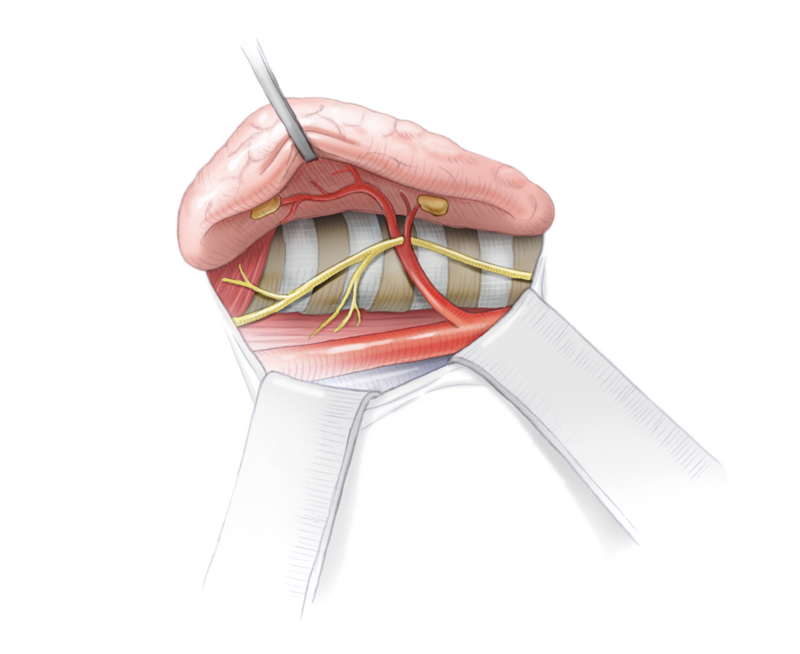 Briefly, an electrical circuit is closed between an electrode attached to the intubation tube lying between the vocal cords and an electrode held by the surgeon. The surgeon can touch suspicious structures with the electrode, if the nerve is touched the electrical circuit is closed, producing an acoustic and optical signal. To ensure that the nerve has not been injured proximal to the stimulation site, the vagus nerve between the carotid artery and jugular vein is always visualized and stimulated at the beginning of the procedure and before its conclusion. If a signal is obtained, the nerve path between the surgeon’s electrode and the intubation tube electrode is intact. 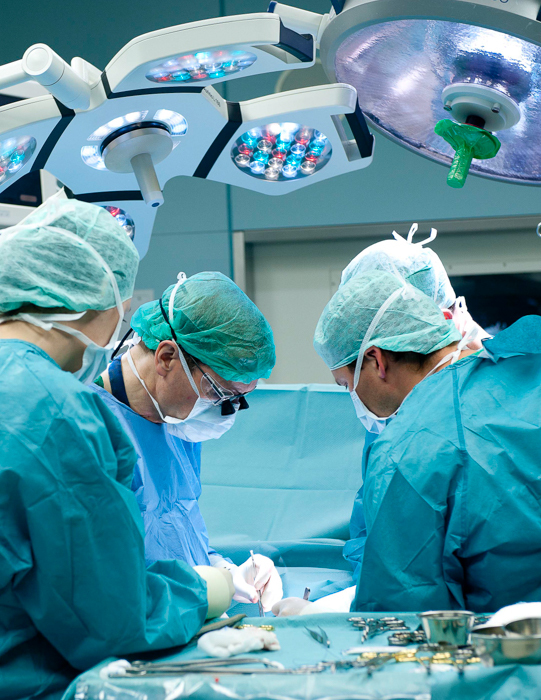 Since no dissection is done further proximal, intraoperative injury can be ruled out there. Failure to obtain a neuromonitoring signal intraoperatively can be due to a nerve lesion or for technical reasons. In this happens, surgery should be stopped after unilateral resection of the thyroid gland; any findings on the contralateral side can only be addressed in a second operation. In the meantime, an ENT specialist can clarify by laryngoscopy whether there is recurrent laryngeal nerve paralysis. By this means, bilateral vocal cord paralysis, the worst complication of this type of surgery, can be avoided. The histology of the resected Knotenbefunde immediately impacts the surgical strategy. Should a carcinoma be found in a unilateral Knotenbefund, if it is over a certain size the contralateral side and possibly the surrounding lymph nodes should also be resected. 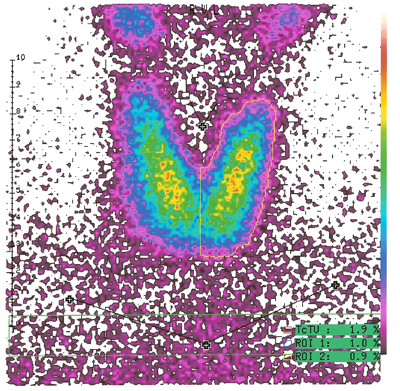 For immediate clarification, every thyroid gland specimen is sent during surgery for analysis by a pathologist using frozen section diagnostics. This can determine with rather good exactitude whether a thyroid gland carcinoma is present or not. Naturally this does not replace complete processing and analysis of the specimens, but it can in most patients help to avoid a second operation. Should a malignant tumor be found only at final histology, follow-up surgery is indicated, optimally within a few days. Otherwise adherences may form which, if revision surgery is performed, greatly increase the risk of recurrent laryngeal nerve paralysis.